Parker 7107 Grizzly Multipurpose Hose is high grade hose made from oil resistant, MSHA approved, non-conductive materials with a 500 PSI rating. 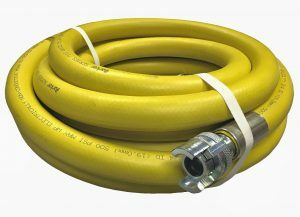 Parker Grizzly Hose is a premium quality domestic hose for demanding applications with a bright yellow high visibility cover. Ideal for hose whip assemblies and rigorous pneumatic applications. It is also a popular solution for pumping fireproofing other thick materials where standard air hose is not suitable for the pressure. Assemblies or bulk hoses are available (assembly minimums may apply). An appropriately rated coupling and installation method is required to achieve the 500 PSI working pressure stated. This hose is not approved for refined fuel, gasoline or diesel dispensing, or engine applications.